One of the largest and most storied Greek fraternities on the University of California Irvine campus is under fire after video footage surfaced showing members of the Asian-American Lambda Theta Delta organization parading about in blackface. Such lowlights hardly mark the first time UCI fraternity members have stooped to such discriminative exploits. 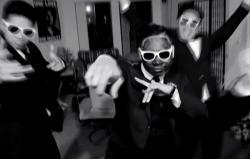 In its fall 2012 recruitment video staged as a costume party, members were also recorded decorated in blackface as well wearing a sombrero and poncho. Frat members have since taken the video down, stressing that it was made by individual members and not approved by organizational leaders, but not before it garnered well over 10,000 views on YouTube. "You're not sorry that you did it, you're only sorry that you got caught," Ainaria Johnson, Black Student Union co-chair, said of the frat's subsequent Facebook apology. "We told them the time to apologize and the time for conversation has passed. None of that can take back what you did." Still others who likewise question the frat's sincerity point to the seemingly cavalier words of Theta Delta President Darius Obana, who explained it all away with the logic: "In a nutshell, it was pretty much just to play that role and be Jay-Z and kind of distinguish themselves from the other guys in the video." At one point, the video was even re-uploaded to the fraternity's YouTube page, where it drew still even more attention before leaders were again confronted and forced to pull it down once and for all. If that's not enough, UCI student Allura Davis points out the video also came equipped with a disclaimer absolving it of all racist offensiveness. "Nobody should have or need a disclaimer about a video they make," she said. School officials, meanwhile, have denounced the incident as "reprehensible" and add that the students in question are now under investigation. Those deemed responsible could face sanctions ranging from a verbal warning to full-fledged suspension. "We'd like to point out that this blackface video isn't the first, nor is it the least, example of racism that's been shown on this campus," said Johnson, adding that some black students have already been forced to move dorms after they were repeatedly subjected to racial slurs from other students. Asian students compose 49 percent of the UCI student body while blacks make up just three percent.